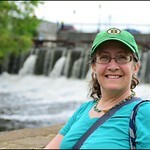 Over the summer while I wasn’t looking, Keene erupted in green. 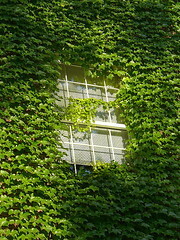 Last week at faculty meeting at Keene State, ivy had grown through an open window and into the classroom where we met, a long, leafy strand wending its way down a desk lined with computer monitors. When even vines are reaching to go online, you know fecundity has gotten out of hand. In the past, I’ve seen the advance of summer greenery as an epic battle, the civilized forces of Clean engaged in a doomed struggle against the natural powers of Green. Last week, as a colleague stuffed an armful of literally invasive ivy into a wastepaper basket, she remarked “Nature’s winning.” Walking around Keene this week with camera in hand, I’ve been tempted to agree. Green’s triumph is merely temporary, however. Already Virginia creeper is starting to redden, a nod toward autumnal creepiness yet to come. You can trim or trash the tangling vines that complicate your days, but they always return with tenacious tendrils. Click here for a photo-set of recent, related images. 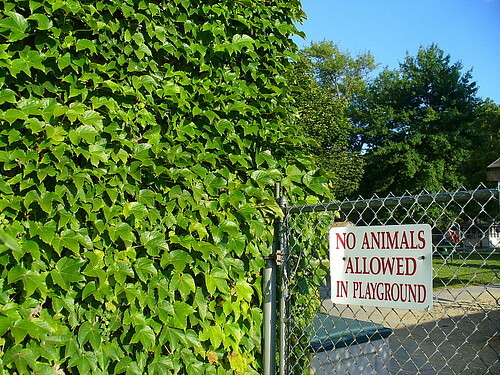 As the photos suggest, it’s a jungle out there. 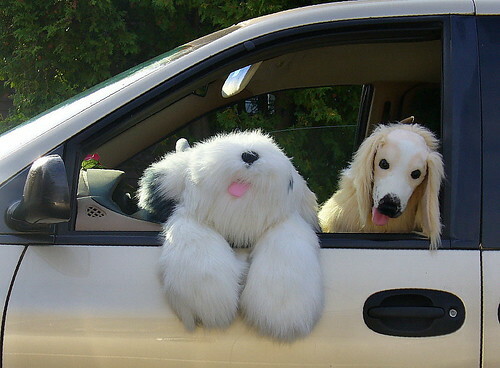 The stuffed dog I spotted at the laundromat earlier this month is back…and he’s found a friend. Here’s hoping Blue Octie has had a similarly happy ending to his tale of lost and found. This morning, after having been away from Keene for most of the summer, I walked Reggie on our usual downtown route before dawn. 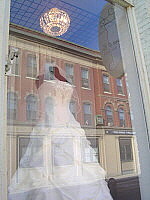 Any sleeping town has its own resonances and romance. This morning I walked with an orange, nibbled wafer of eclipsing moon hanging low on the horizon over one shoulder, racing. By the time Reggie and I had circled downtown and returned home, the sun was up and the moon was gone. Carrying a camera on a pre-dawn dogwalk is fairly futile: the only thing you can shoot is the glow of downtown shop windows. 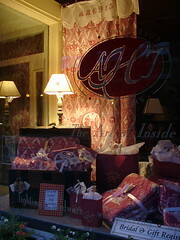 That being said, shooting shop windows is something of a specialty of mine. Now that students are back and my first classes are set to meet this morning, it seemed somehow appropriate to walk the town when few other folks were awake much less walking. 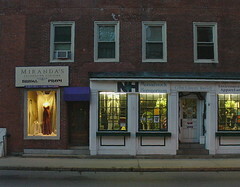 In the pre-dawn, downtown Keene is all mine, shared only with an eclipsing moon and a restless dog who pulls, urgent, too sniff every crevice. For a dog, finding home is an easy, unambiguous thing: home is where you sniff, pee, and sometimes sleep. 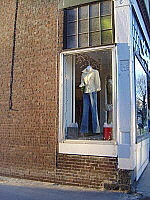 For a camera-toting place-blogger, I find myself a bit disoriented by this present back-to-school: am I any more at home in a town where I merely work than any of the first-year students who have only this weekend found their feet here? In Boston this weekend, I overheard some brand-new university students talking amongst themselves on the T. “Does our dorm have washing machines,” one asked; another grunted in the affirmative. “Let’s go find them,” the first suggested with surprising enthusiasm. It felt like forever since I was a first-year student amazed at the prospect of doing my first away-from-home load of laundry, the basement washroom of my first-year dorm offering more social interaction than my bland cell there. How long did it take before the novelty of laundry faded into yet another routine? When you’re a young student away from home for the first time, the entire world looks new, your mind itself glowing with the fuzzy promise of pre-dawn awareness. When you’ve been around the block for more than a few back-to-schools, it’s easy to think you know the place. You don’t. The lesson of any sleeping town is the sheer novelty of vision: here, the same town I’ve seen countless times by daylight looks different by dawn. Here, the same town I’ve seen countless times by daylight looks different because I myself am different, my own soul moving through its own secret cycle of dawn and eclipse. Of all the pictures I took at Saint Anthony’s Feast in Boston’s North End today, this is my favorite. If you’re not Catholic–or even if you’re a non-observant Catholic or a Catholic who didn’t grow up in an Old World ethnic enclave–it’s easy to be mystified by over-the-top Catholic festivals. 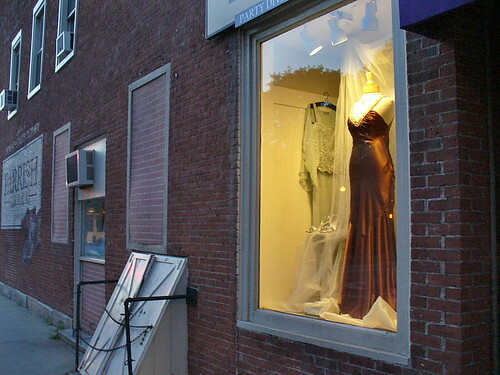 Boston’s North End is a tourist magnet for its Italian restaurants, gelato shops, and bakeries, and the North End’s annual saint days, celebrated with much pomp and festivity, are particularly popular with visitors. 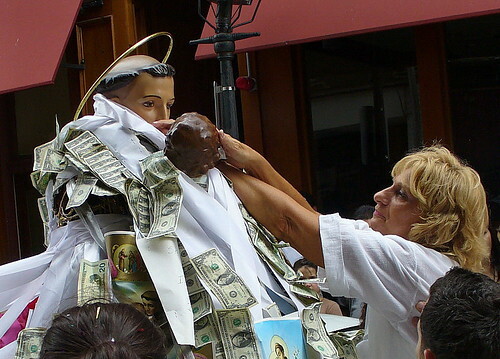 The look in this woman’s eyes as she hangs a dollar-adorned scapular on a statue of Saint Anthony of Padua, however, says everything you need to know about the spirituality of Italian-American festivals. 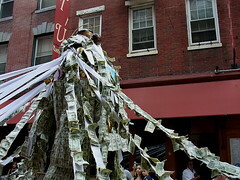 As Saint Anthony was processed through the North End and then enshrined in an open-air structure on Endicott Street today, believers covered his image with dollar bills–ones, tens, twenties–each one representing a solemn prayer. 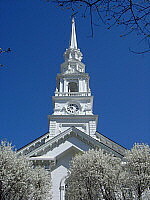 It’s easy to scoff at someone else’s beliefs, seeing another’s spirituality as nothing more than superstition: my favorite wry definition of the word “cult,” in fact, is “The house of worship down the street from yours.” But as someone who’s grown fond of my own Buddhist gold guys, I have no right to criticize Catholic devotion. If I’m going to argue that Buddha statues are visual emblems of spiritual attributes, I have to admit the same for Catholic statuary. You might not believe that pinning money on a statue will make your prayers more efficacious…but believe me when I say an entire neighborhood of Italians and a fair share of visitors believe there’s something spiritual about coming out on a hot summer day to do your praying and processing in public. 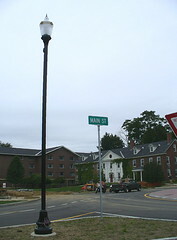 As suspected, the rotary construction that’s been causing detour headaches in Keene this summer will not be finished for this weekend’s move-in of new and returning Keene State College students. Like it or not, the promised rotary is still a work-in-progress. 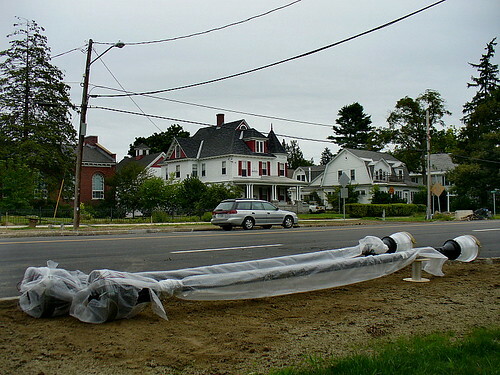 Yesterday, on my way to campus for several faculty meetings, I saw workers erecting some finishing touches on the yet-unfinished project: fancy new street lights to illuminate the intersection of Main, Winchester, and Marlboro Streets. Once students (and their parents) have survived the traffic hassles of this weekend, their way will be newly lit to and from various off-campus attractions. It’s fitting, I suppose, that the rotary is still unfinished given how much my own semester prep is behind schedule. Yet again this year, I planned to spend much of the summer completely revamping one of my courses (this time, Expository Writing)…but instead, as usual, I’ve left the business of “completely revamping” until the weekend before classes begin. Two years ago, I re-wrote my Essay Writing syllabus in an adrenaline-fueled early morning session the day before classes began; this time around, I’m hoping a weekend will be long enough to for me to revise yet another syllabus. In the meantime, I have end-term grading to tend to, two online classes to prepare, Blackboard sites to tweak for my Keene State classes, etc. It seems that “unfinished” is the biggest thing Keene and I have in common these days. 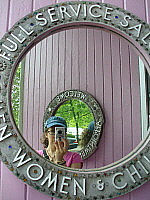 This is my contribution to today’s Photo Friday theme, Unfinished. 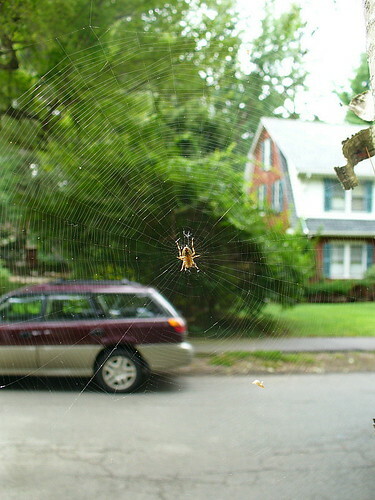 Whenever I feel exhausted and overwhelmed with work–like now, as I look ahead to a weekend where I’ll be swamped with back-to-school preparations for one institution and end-term grading for another–it’s comforting to consider the industry of spiders. It must take hours of delicate, tedious spinning to craft an orb alongside a shady sidewalk…and in seconds, all that work can be destroyed by a passing hand. What keeps any spinning soul from tiring or giving up hope? 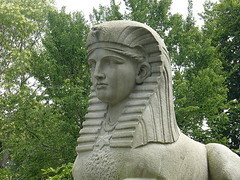 Riddle me this: why is there a sphinx in the middle of Mount Auburn Cemetery? On Monday my friend A (not her real initial) and I met in Cambridge, Massachusetts for a cemetery stroll before heading to nearby Watertown for the best pancakes in town. I’d never been to the Deluxe Town Diner; A had been to Mount Auburn Cemetery only once before, and then only briefly. It seemed a fair trade for me to show A around my favorite garden cemetery (and the nation’s first) before she initiated me into the culinary wonders of sour cream and buttermilk flapjacks and New York style potato pancakes. After all, we’ve made something of a tradition walking off potato pancakes, so it seemed only fair to broaden our horizons by finding another establishment that serves up the tasty goods. But back to my initial question. In Greek mythology, the sphinx asked passersby a riddle, and those who could not answer were subsequently strangled. 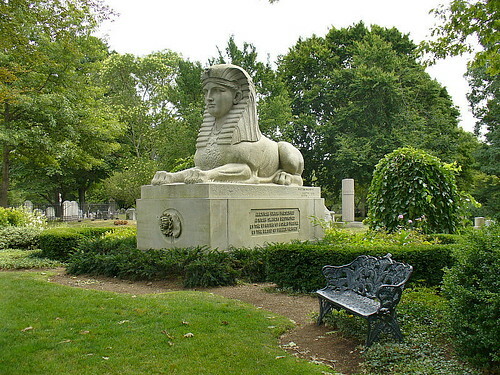 So, why is there a sphinx in the middle of Mount Auburn Cemetery? Mount Auburn’s sphinx sits directly facing Bigelow Chapel: apparently, this is a Christian creature, not any sort of Greco-Egyptian pagan. And instead of commemorating anything remotely Greek or Egyptian, Mount Auburn’s sphinx is actually a Civil War memorial commemorating the Union dead. If you’re still missing the connection between sphinxes, the Civil War, and Cambridge, Massachusetts, you’re not alone: I wanted to show A this particular memorial precisely because it makes no sense. And where else in Massachusetts would you be able to ask your own questions of a sphinx before heading out for potato pancakes? 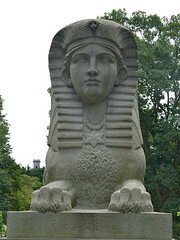 Truth be told, the reason there is a sphinx at Mount Auburn Cemetery has more to do with 19th century style than it does with the Civil War itself. 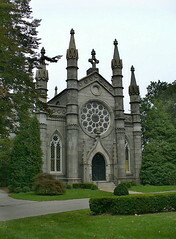 Mount Auburn Cemetery was founded in 1831, and by the time its entry gate was rebuilt in 1843, Egyptian Revival was all the rage. When sculptor Martin Milmore was commissioned in 1871 to construct a memorial to the Union’s Civil War dead, he followed the prevailing style of the day and produced an impressive (but today, woefully anachronistic) monument. Whether or not there is any connections between sphinxes and the American Civil War, 19th century Victorians would have been impressed with a memorial that was both epic and monumental. It matters only to purists, I suspect, that Ms. Sphinx looks particularly Anglo, like any conventional 19th century American beauty. Like any sculpture park, Mount Auburn Cemetery says a great deal about contemporary taste, the trend toward garden cemeteries marking a move from the bleaker spiritual vision of earlier cemeteries. 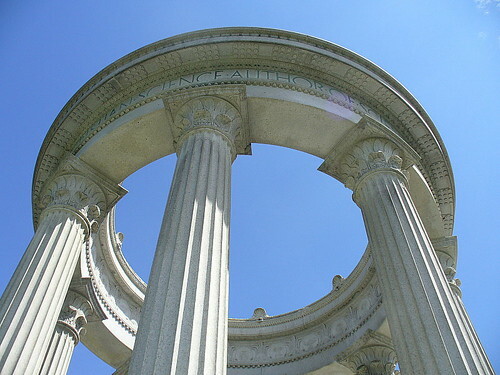 Garden cemeteries such as Mount Auburn were designed to sooth the souls of mourners through park-like landscaping and beautifully sculpted memorials. 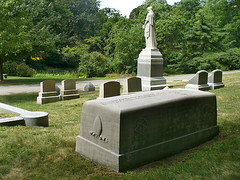 Many of Mount Auburn’s more impressive monuments reflect a Neoclassical style that evokes a mood of tranquil serenity. 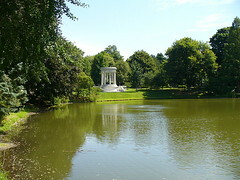 Mary Baker Eddy’s memorial, for example, looks calmly reassuring whether contemplated across Halcyon Lake or viewed from below. 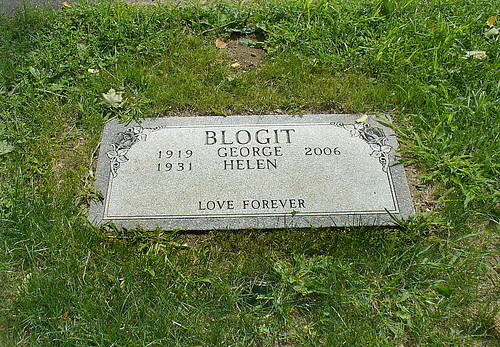 That being said, though, part of the fun of strolling a garden cemetery lies in the element of scavenger hunt: who can find the most ostentatious, unusual, or exotic memorial, and what things can you find during this visit that you haven’t noticed in the past? 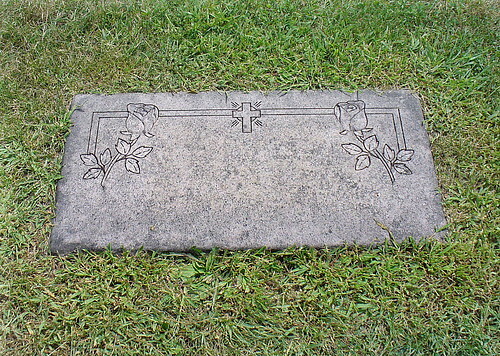 On Monday, both A and I simultaneously remarked about a stone I don’t recall noticing before: the weighty marker for Manton Eastburn, the 19th century bishop of Massachusetts whose grave marker struck both A and me as looking exactly like a butter dish.